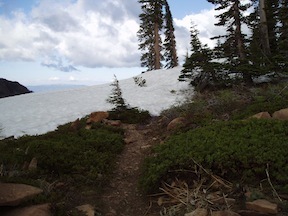 On two short backpack trips from June 11 to 16, I surveyed the PCT from Barker Pass to Tinkers Knob. About half the trail was snow covered at the time, so I can’t say too much about tread conditions, but I did record the downed trees, of which there are a moderate number, some from last year (or several years ago in one case), and some from this year. Since over a month has passed since these trips, I won’t post the details about snow and trail conditions because they have changed. There is a sign at the junction of the PCT and what I call the Western States Trail that says Tevis Trail and points at an angle for the trail departing to the west. I don’t remember seeing this sign before, thought it is well weathered, so perhaps it was on the ground and only recently placed back on a post. I still think this trail should be called Western States Trail since it seems to be the most common route of that trail over the years. The course for both the horse and running races has changed many times over the years. Since the road to Barker Pass was still closed by snow, I walked up the 4WD road and back down the paved road. Once was enough, for both. This entry was posted in Trip Reports and tagged 2009, Barker Pass TH, Pacific Crest Trail, PCT, Tinkers Knob on 2009-07-21 Tuesday by Dan Allison.